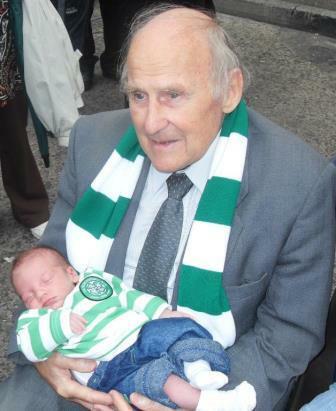 It was with great sadness that the football world learned of the death of Belfast Celtic Society’s president Jimmy Jones on Thursday, 13th February 2014. A legend of the Irish League, Jones began his senior career with Belfast Celtic. In 1946, he was signed by the club’s famous manager Elisha Scott, whose teams swept all before them over a period of two decades. Scott had first spotted him on a six-goal spree for Shankill Young Men in Lurgan. 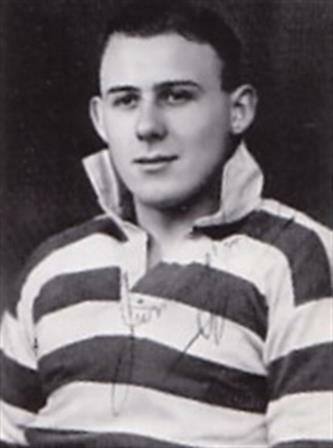 A barrel-chested centre forward, Jones was a mainstay of the Celtic side during the late 1940s. He turned down opportunities to switch allegiances to rivals Linfield as well as to cross the water to play for Matt Busby at Manchester United. In December 1948, Jones’s career – and, indeed, his life - was thrown into peril when he was attacked and suffered a broken leg at the end of the Christmas derby game at Windsor Park. A section of the Linfield support rioted at the end of a tempestuous 1-1 draw and Jones was unable to get to the dressing rooms before a serious assault took place. That incident eventually led to the withdrawal of Belfast Celtic from football in the summer of 1949. Jones’s life was saved by his friend Sean McCann, the Ballymena goalkeeper. He subsequently spent many months recuperating in the same hospital where leading orthopaedic surgeon James Withers had fought to save his leg from amputation. During a course of treatment in Harley Street, London, he made an agreement to sign for Fulham. His ambition to play in the Football League was scuppered by complications regarding his registration. When he eventually returned to play the game, his goal scoring exploits continued unabated. Born in Keady, County Armagh on 25 July 1928, Jones had been on the books of Linfield as an amateur. He had failed to retain his registration before Scott pounced to bring him to Celtic Park, where he played alongside great figures like Charlie Tully and Harry Walker. During his prolific career, Jones won three international caps for Northern Ireland, while his representative honours included a hat trick for the Irish League against the English League in a 5-3 victory at Windsor Park in 1953. He was also a motorcycle enthusiast, competing in the North West 200 and Skerries 100 races. He was also a regular visitor to the Isle of Man TT races. 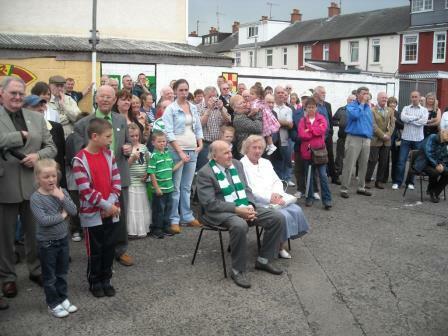 In 2003, Jones was invited to become the inaugural President of the Belfast Celtic Society and remained in this position until his passing. He was a regular at Belfast Celtic Society events and nostalgia nights, frequently accompanied by his devoted wife Cecily and his children Trevor and Jennifer. In 2010, he cut the ribbon at the opening of the Belfast Celtic Museum in Belfast’s Park Centre alongside Heidi Boyle, daughter of another Celtic legend, Paddy Bonner. Society chairman Padraig Coyle said: “Jimmy was a treasure - all of us in the Society feel much richer for having shared so much time with him over the years. He loved coming to our gatherings and would often roll up his trouser leg to reveal the old injury on the leg that had stood him so well in almost two decades of football.Jimmy never lost his regard for Belfast Celtic and spoke often of how well he was treated by the club during his time at Paradise. He was never put out by being accosted by well wishers and autograph hunters but was always baffled as to why he was held in such awe and treated like a star." “It was with much hilarity a few years ago that, at the unveiling of a mural in his honour completed by children in the St James’s area of Belfast, babies were pushed into his arms for him to kiss. In 2001, a group of former Belfast Celtic players – Jimmy, Ossie Bailey, Leo McGuigan, Jimmy Donnelly and George Hazlett - were invited to Celtic Park in Glasgow by the then Celtic manager Martin O’Neill. O’Neill professed himself thrilled to meet ‘the great Jimmy Jones’, with characteristic modesty, Jimmy could not quite work out why! The old players were led out onto the pitch and reaction from the fans was absolutely amazing - the old men were given a standing ovation." 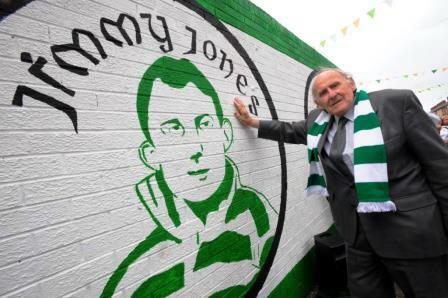 “The Belfast Celtic Society committee and members are deeply saddened by his passing and our thoughts are with Cecily, Trevor and Jennifer and the entire Jones family circle at this very sad time.“On behalf of Belfast Celtic fans and well wishers the world over, thanks for the memories, Jimmy."